The record player has come back into fashion recently, and it is easy to see why. When we watch films and TV shows about the past few decades, there is always that sense of freedom and relaxation that comes with the record player – a call back to youth and a time when things were simpler. The GPO Memphis captures this feeling, and so much more. 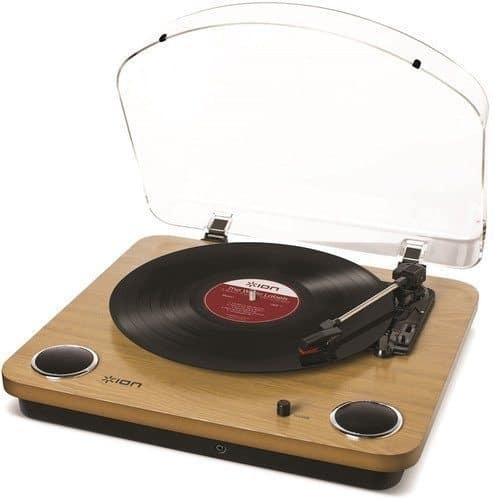 This record player comes from a brand that is well-known and popular, as well as trusted by many, reassuring you that you are going to get something that is excellent quality when you pick it up. With classic features that you would expect from any turntable, it has everything you need to start dusting off those old vinyl records. However, it also has a load of modern twists that are sure to interest you. Below, I have taken the time to write a detailed review of this excellent little record player, talking about what makes it so fantastic, as well as a couple of the areas that could do with improvement. So, why not take a moment to kick back, read my GPO record player review, and see if this is going to be the perfect model for you? This record player doesn’t just look amazing, it also has a fantastic range of features that you are sure to love. Made to be retro with a modern twist, it allows you to listen to the music you love in new and exciting ways. Coming in at a reasonable price, it’s worth snatching up. 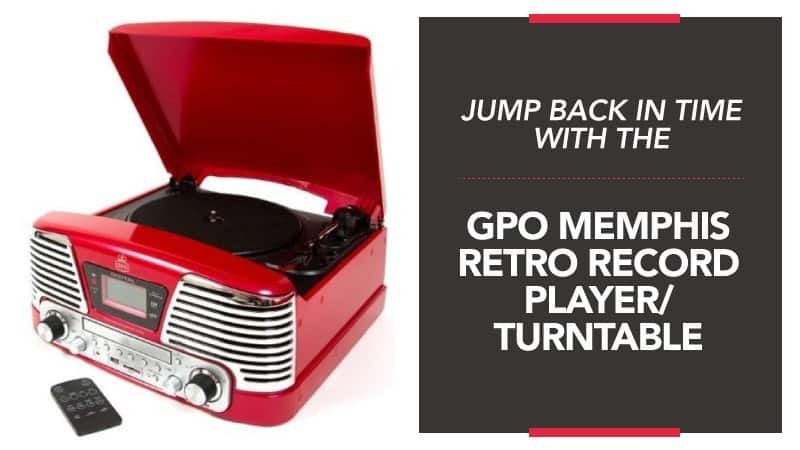 If you want a record player that is stylish, good quality, and ready to go from the moment you pick it up, then the GPO Memphis is a great choice to make. It has so much going for it, including a few nifty features such as connecting your smartphone and a headphone jack. There’s too much to summarise in this little section, so it’s worth checking it all out in the next one. As with anything, this isn’t going to be the best vintage record player for everyone, and you may find that one of the models in our comparison section at the end is better suited to you. It’s a little bulky, and the included speakers are good, but also not the best out there. It also has a lot of extra bits that come with it, so if you are searching for a simpler and more classic model, it may not be the best. The overall design of the GPO Memphis record player is sublime. It looks like an old retro stereo and comes in four vintage colours that really throw you back into the past. It’s a clever and unique look, as well as one that will look amazing anywhere in your home. To access the record player, you simply need to open up the top, and the lid acts as a dust cover to keep everything protected. The controls are on the front, making it fully functional and really grasping the feel of the retro look. They are clearly labelled for your ease of use, and there is even a remote control so that you don’t always need to get up in order to make adjustments. This can also be used with the CD and radio functions, two things we look at in the next section. The digital LCD display is also great for checking the time, which track is playing, and the station that you are currently listening to. The volume range is also very good, providing you with music that is loud enough for everyone to hear. However, it can distort a little when at maximum volume, so external speakers might be a good plan if you want to bring the house down. It also includes an automatic stop function, meaning that you don’t need to make manual adjustments to the record player to move to the next track. The arm is also really good, with a nice balance and light build that can be adjusted according to your personal preferences. It even comes with a spare stylus needle in case the first one is lost or damaged. It should also be noted that the stylus is gentle on your records, preventing scratching and other potential issues. There are some fantastic tech additions to this model, the first of which is the USB port and SD card slot. Each of these can be used to convert your records into digital files, allowing you to listen to them on your phone with great clarity. The included software is quick and simple to use as well, so there is no stressing over how to get it done. While there is a good set of speakers built into the stereo, as well as an amp for those wild parties, you also have the option to use external speakers. It is compatible with absolutely any model, so you can use ones you already have at home if you want to. There is also a headphone jack if you want to plug in, but it doesn’t always stop the music from playing through the speakers, so that is something to keep in mind when you go to buy. The GPO Memphis also has a CD player built into it as well as FM radio, giving you more options and a more versatile machine. The CD player is located discreetly below the LCD display, and the radio tuner is with the rest of the controls for easy access when you need it. Both bring a little something extra to the stereo, and really help to fully integrate the old tech with the new. Leading on from that, you can also plug your smartphone into it for smooth streaming when you feel like listening to something different. The cable comes with the record player, and it will play the music through the speakers (either internal or external). This is ideal if you find that your music is split between multiple mediums. 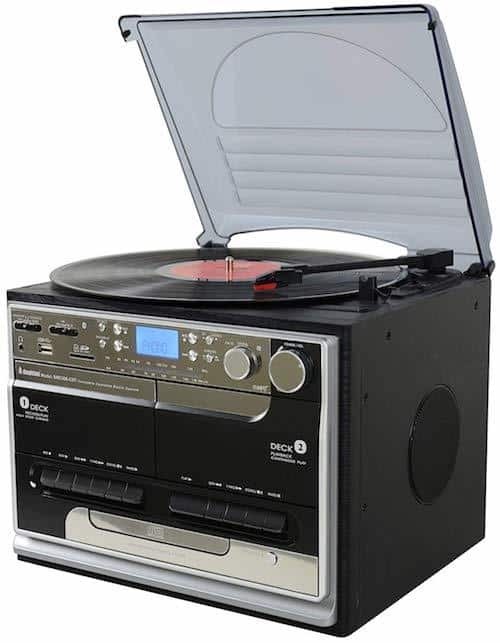 Due to the bulk and size of this record player, it is not the most practical if you are looking for something that can be carried around and easily transported. It is better suited to staying in your home, but it will definitely sit nicely wherever you place it. It is surprisingly lightweight as well, weighing only 3.5kg, so it won’t cause any strain on your shelves or end tables, and if you need to move it to a different location, it won’t take a great deal of effort. 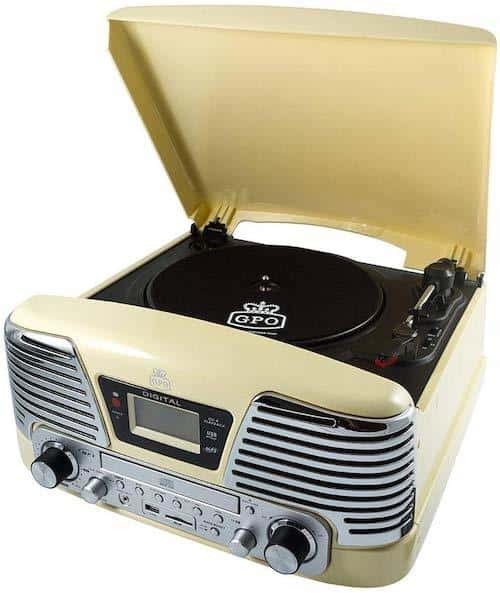 Here are some other, similar, models of record player for you to consider, just in case you want to look at other options before you commit to the GPO Memphis. 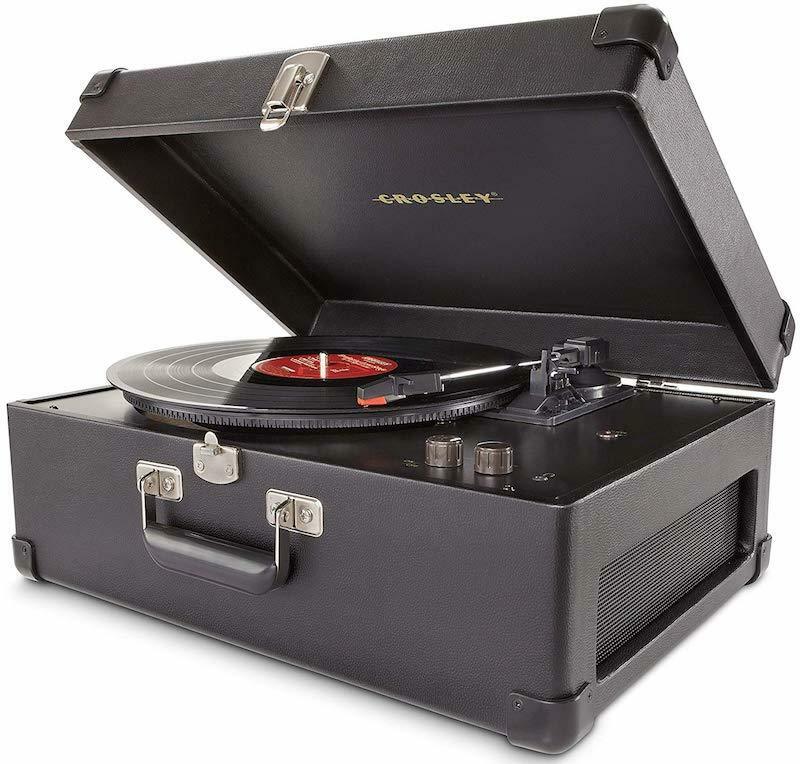 Why not take your record player around with you in style? With a pretty smart briefcase design, you can store everything away safely and take it anywhere you want. It can convert your records into digital files with ease, and can even be hooked up to external speakers if you want that extra level of musical bliss. It’s also really easy to control and comes at a great price for most budgets. Affordable and good quality, this Ion record player was made to have a retro look and feel, while also bringing in a whole load of modern components that are neatly hidden away. The USB port allows for quick and easy music conversion, so you can listen to your records on your mobile device. It even allows you to hook your smartphone up and has a headphone jack for when you want private time. Yes, this Steepletone record player is bigger and bulkier than most, but this is because of how much it offers you – and it comes at quite a reasonable price considering this. Not only does it have modern features like file conversion and streaming straight from your smartphone, but it also has an FM radio installed and excellent speakers for a good quality listening experience. We hope that you have found this GPO record player review helpful, and that all of the information I have given you is able to aid you in deciding whether this record player is going to be the right one for you, your home, and your needs. It’s such a great model, and part of the appeal is because of the unique design – there isn’t really anything like it on the market. It’s multi-functional, offering you the choice to listen to vinyl records, CDs, or just switch on the radio. Plus, it uses connectivity via phones and USB ports to really enhance the experience. The speakers that are integrated with the machine are not the best out there when you have it on max volume. However, there is the option to plug in the externals, and the headphone option isn’t the most practical. However, the small niggles aside, this really does make for a fantastic piece of tech and one of the best record players out there. It might just surprise you. What did you think of our GPO Memphis review? Do you agree with our thoughts on the radio we reviewed, or are there others that you think are better suited to the task? We love hearing from you, so make sure you leave us a message in the comments below.